Industrial veterans, Sounds of Mass Production a.k.a. 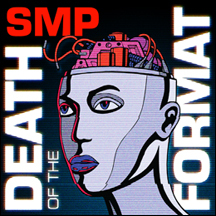 SMP, are set to release their 7th studio album, Death of the Format. Two years in the making, Death of the Format can be considered one of SMP's most complete albums to date. Jason Bazinet, the mastermind of SMP, returns to his roots and delivers an album that can be described as industrial rock with heavy influences of rap and punk. Tracks like "In Your Blood," "Somebody Dissin You," and "What's Wrong with You?" showcases the more rap elements that has become SMP's signature. Other tracks like "Metal Madness" and "Earthlight" take on a more cold wave industrial vibe. Overall, Death of the Format should continue to build on SMP's legacy and garner the accolades they deserve. Over the years Jason has worked and toured with industrial giants Front Line Assembly, Christ Analogue, Chemlab, 16volt, Left Spine Down, Stiff Valentine, Pigface and 64K.